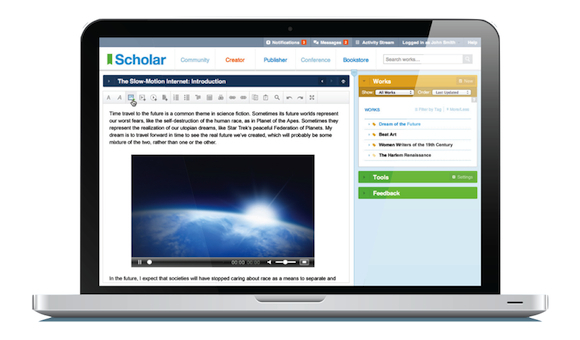 Scholar is a place for the creation, publication and dissemination of new knowledge, from informal posts that prompt conversations among peers, to formal peer review and publication of knowledge. It represents a quantum leap beyond the old fashioned document formats, change-tracking routines, and file-shuffling knowledge management and publication systems. Scholar is a cutting edge, peer-to-peer “social knowledge” technology, for learning communities from Grade 4 to Higher Education. In Scholar, creators develop multimodal works that can include text, image, video, audio, dataset—and in fact, any other digital media. Scholar supports publishing to multiple formats, with no messy documents, files or emails—from children’s school projects to scholarly journals and books. Represent your knowledge using Scholar’s clutter-free and powerful web authoring tools in the Community dialogue area and the Creator web writing space. Include text, image, video, audio, dataset, or any other file. Use customizable filters to evaluate knowledge, including rubric-based reviews, in-text annotations, knowledge and information surveys, and a natural language processing checker. Perspectives include self-evaluation, peer evaluation, and evaluation by the people (admins) coordinating knowledge communities or classes of students. Join others in Scholar for knowledge and learning conversations, with optional feeds to Facebook and Twitter. In Scholar, the social glue is "peers" in dialogue and giving structured feedback in knowledge producing communities, rather than "friends" or "followers." Common Ground Research Networks has been building leading edge semantic publishing technologies since 2000. We have also taken a leadership role in considering the future of our profession, reflecting on the future of the scholarly journal and through membership of the Committee for Digital Innovation of the American Publishers Association. Create a Scholar Account Today.